The river was running a bit high, but clear and looked to be in great shape for fishing. I prepared my equipment, and then I hiked across the bridge by the rest stop and waded downstream. Shortly I encountered another fisherman, so I decided to give him space and turned around and began fishing back upstream toward the bridge. I tied on a yellow Maddam X and then a Copper John dropper. I caught five nice browns, as I worked my way back up to the rest area. 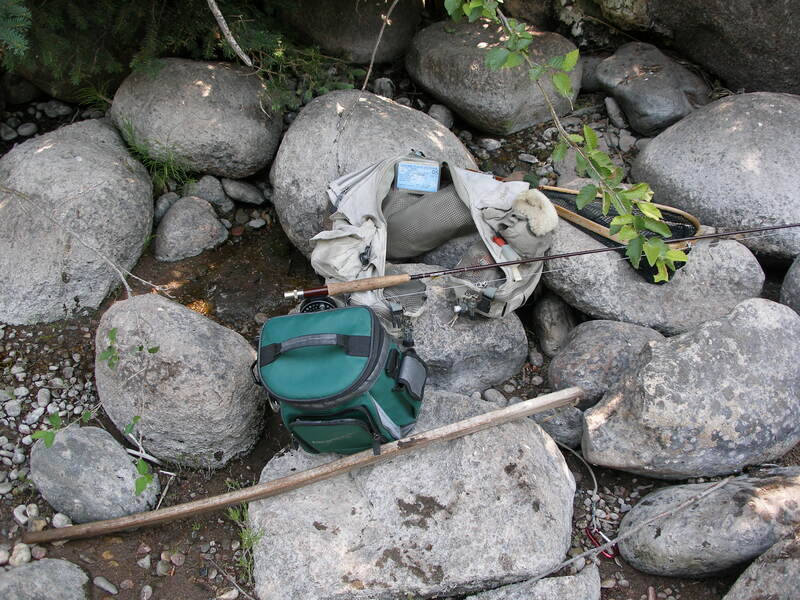 All the trout were caught along the left side in pockets or along the rocks on the bank. One rose to the Madam X, but most took the Copper John. I took off my gear and went back to the car for my lunch, and then I returned and ate by the river. It was getting very warm. High temperatures in Denver surpassed 100 for the sixth day in a row. After lunch I began fishing upstream from where I ended. I tied on a yellow Letort Hopper to get more flotation and a beadhead hares ear. Eventually I added a beadhead pheasant tail, when I saw what appeared to be pale morning duns emerging, but the hatch was not heavy enough to bring on surface feeding. I was unaware that some Hispanic guys were sitting on a large boulder next to the river, and as they watched, I hooked my largest brown of the day. One of the guys moved down the bank to watch me play the fish and land it, and I snapped a quick photo for memory’s sake. I moved upriver and covered more water in the afternoon. I got very warm. 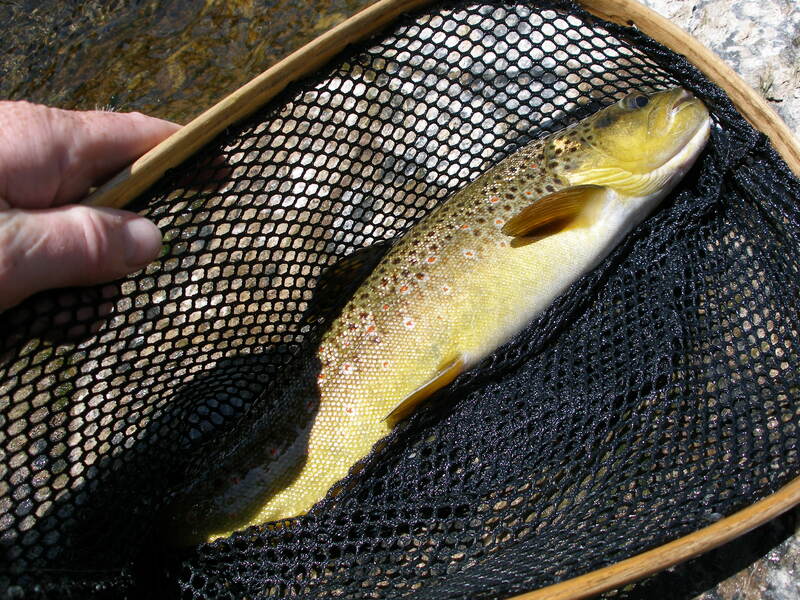 I caught a couple brown trout in the pocket water above the nice pool, when I was forced to circle around, as a guide was directing two female clients. I did not catch anything from the pedestrian bridge all the way around the next bend, but I did manage one last brown in the small braid around the next bend. Most of the afternoon fish took the beadhead hares ear nymph. We camped at Little Maude after arriving late Friday night and snagging one of the last camp sites available. Jane dropped me off at the downstream border of the upper public water around 10AM. I began fishing a yellow Letort hopper with a beadhead hares ear. There was a nice long run feeding into a beautiful pool in the private water. I saw several fish flash to the hopper, but none made the mistake of eating my imitation. 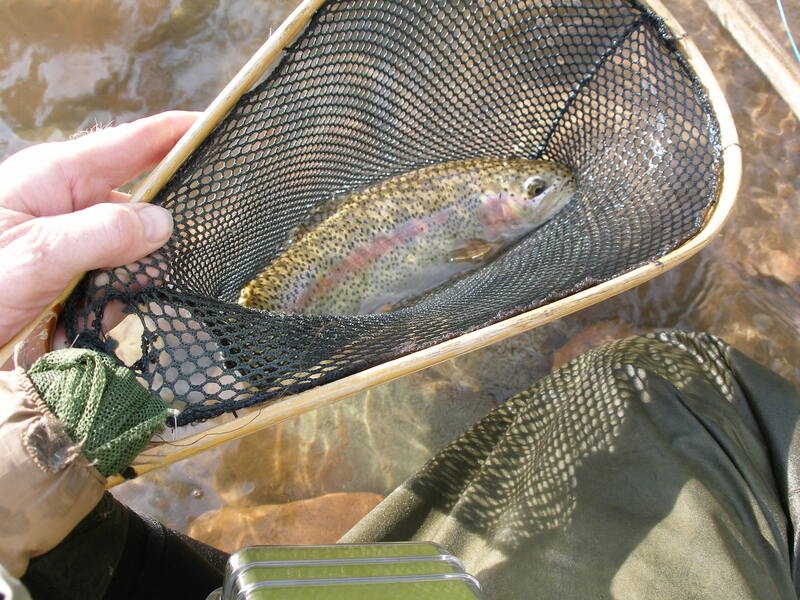 Toward the top of the run, I hooked and landed a beautiful rainbow (see photo) on a beadhead pheasant tail, that replaced the original hares ear. 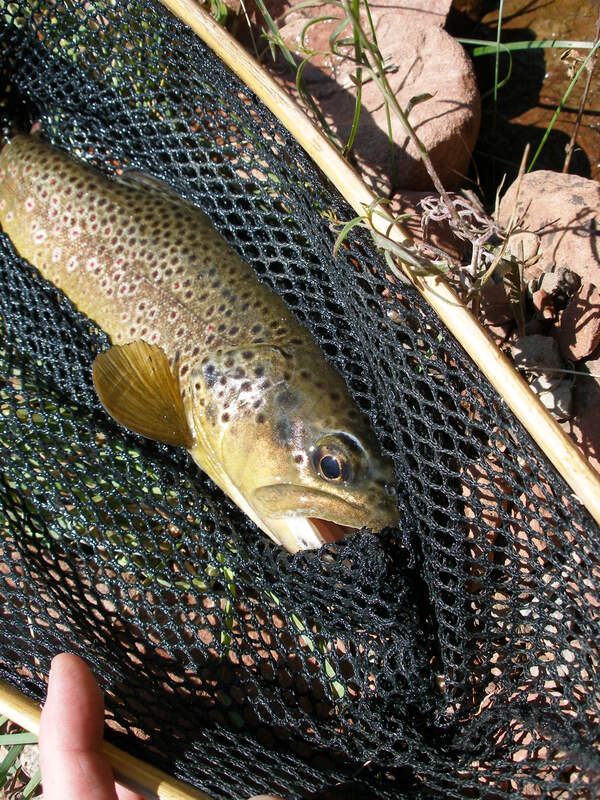 I continued working upstream and caught three small browns. When I approached the area with the log forming a dam, where Jeff and Martin and I began previously, four fishermen appeared above me. 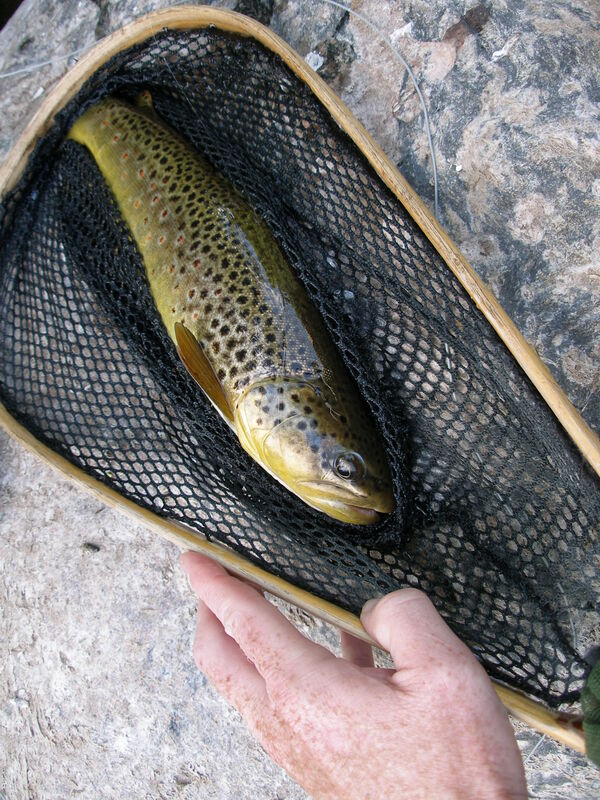 I worked the slack water next to the large rock along the bank below the log and picked up a nice brown (Frying Pan Brown photo). I broke for lunch, and Jane picked me up and took me back to the camp site. After lunch she dropped me off at the spring in the next stretch of public water downstream. I walked down the road a bit and began fishing pocket water. The Pan was clear and flowing at nice levels. I tied on a Madam X with grey body and then attached a beadhead hares ear. There were some nice pockets, and I had some looks, but no hook ups. I spotted some large mayflies emerging and a couple rises, so I put on three types of green drakes, but no success ensued. Then I thought perhaps PMD’s were emerging, so I tried one of them. Again no success. I fished from 1-3 with no luck, but I knew there were fish, so I switched over to nymphing with a beadhead pheasant tail and a beadhead hares ear combination. It was magical, and I caught five trout in the next hour, mostly on the BHHE. I exited the stream and walked back to the spring to meet Jane, but when I arrived at the pick up point early, Jane was not present, so I crossed the road and found a nice deep run near the road. I cast the nymphs and quickly picked up two browns. At 4PM I stopped and waited for Jane. Jane and I drove to Basalt to meet Dan, who was driving from Denver on Saturday. We stopped in the supermarket and then the fly shop, where I bought new laces for my wading boots. Dan called and said he would not arrive until later than expected, so I took the van and drove to the Roaring Fork River, where it flowed along the road before intersecting with CO 82. The river was running high but clear, and it was difficult to find slack water. Since I had success on the Frying Pan with nymphing, I elected to stay with the same setup and fly combination. 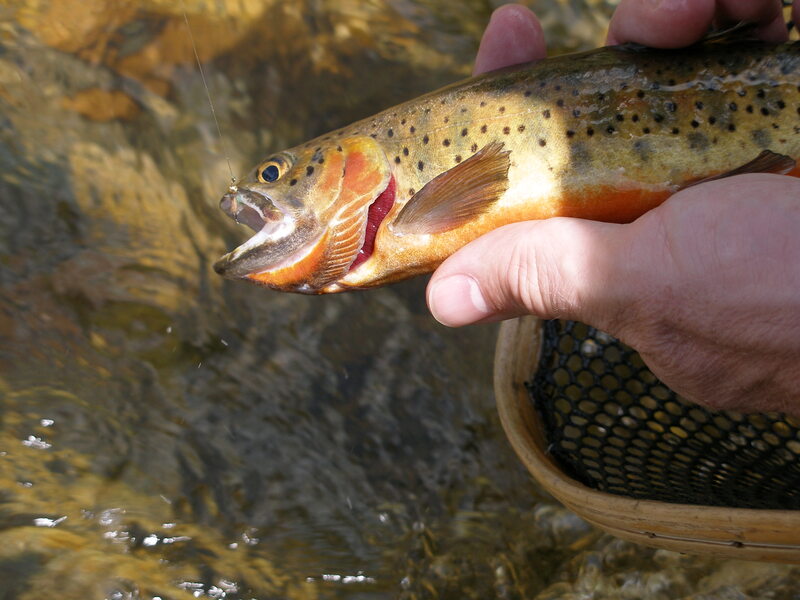 I worked my way upstream and caught three trout. 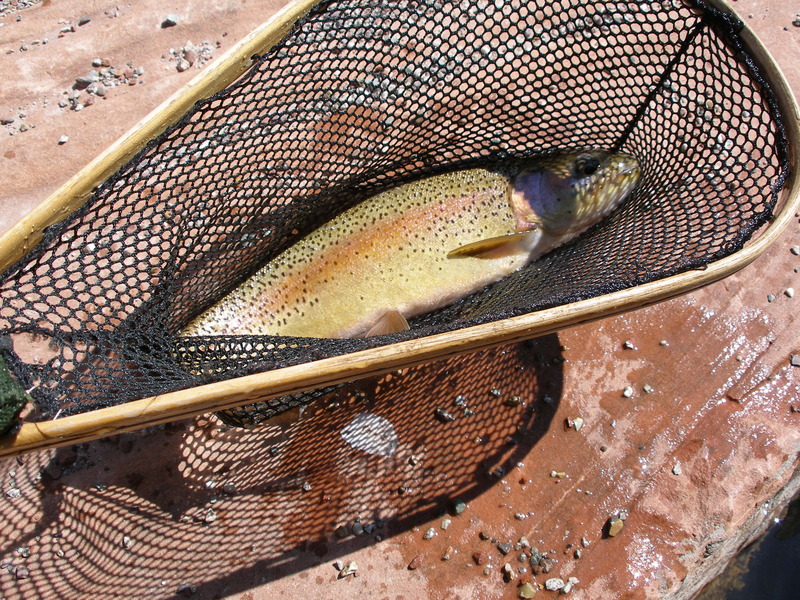 The last one behind the Basalt wildlife park was a spunky rainbow (Roaring Fork Bow photo). Two of the fish took a beadhead hares ear, and one took a copper john. Location: Above Ypsilon Lake trail fork. John Broadbent and I traveled to the Lawn Lake trailhead and packed our fishing gear up the Lawn Lake Trail to fish the Roaring River. It was John’s first attempt at fly fishing, and I planned to guide him. John fished from 11-12:30, as I coached and guided him on casting. He caught two greenback cutthroats, one on a yellow Madam X and one on a beadhead pheasant tail. We returned to where we stashed our gear and ate lunch. After lunch we headed back to where we ended, and we both fished. John worked the right side, and I worked the left, as we moved in parallel upstream. I used an orange Madam X and tied on a beadhead green caddis pupa as the dropper. I caught around 8 greenbacks, one quite nice for this stream at around 10 inches. John meanwhile caught one on his own using a beadhead emerald caddis pupa. After returning to the campground, Jane and Dan decided to gather some firewood while I fished the beaver pond area of Barrett Creek. The creek was high, but I concluded that fishing was possible. I adopted the same Madam X/dropper setup I used on North Fork of Little Laramie River, but I substituted a beadhead hares ear. 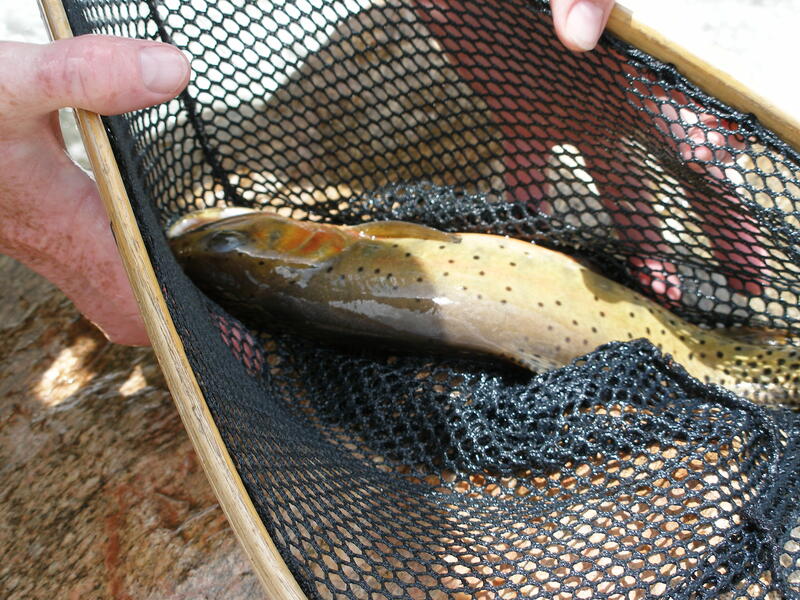 Within an hour I caught and landed 12 brook trout, but I did not count the very small ones. Dan joined me and made a few casts and caught three or four brookies as well. I dropped Dan and Jane off at the west trailhead, since they planned to hike to the summit of Medicine Bow Peak. They left their bikes chained to a bike stand at the parking lot, as they expected to bike the “mostly” downhill 10 miles back to the campground after their hike. I continued east on route 130 to the turnoff for North Fork Campground, and then I went north 1.5 miles to the pullout by the first bridge. Somehow I did not have the elastic band attached to my sunglasses around my neck, and I dropped them in the stream. Being nearly blind at this point, I stumbled back to the car to get my regular glasses and then returned and searched the stream bottom methodically. Eventually I saw them wrapped around a rock, but it was quite a scare. I worked my way upstream fishing a yellow body Madam X with a beadhead pheasant tail. 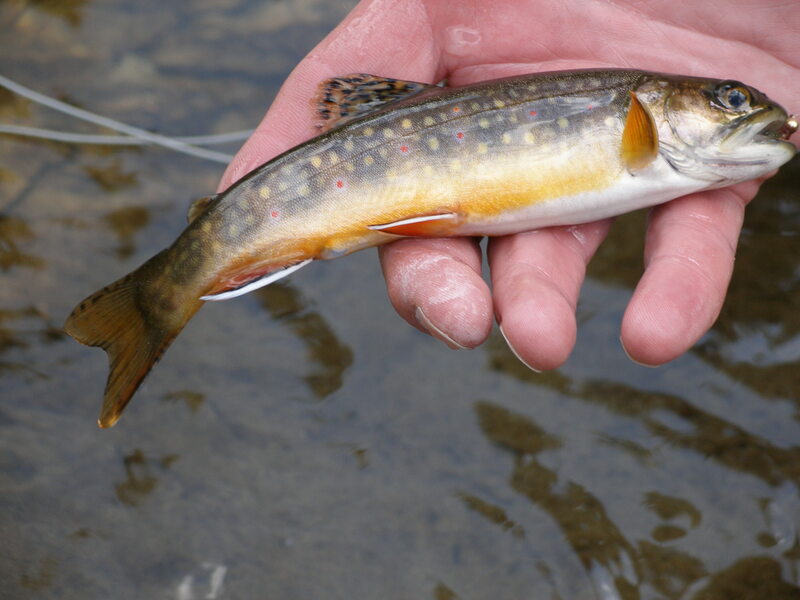 The stream was loaded with brook trout, and I picked up brookies in nearly every good spot that contained depth and was sheltered from heavy current. 75% of the brook trout took the nymph and 25% rose to the Madam X. After two hours I caught around twenty trout and reached the campground road, so I headed back down the road to the car. On the way back, I stopped at the Medicine Bow Peak trailhead, and both mountain bikes were still chained up, so Jane and Dan had not yet returned from their hike. I waited twenty minutes, at which point they arrived. They desired to bike back to the campground, so I played hopscotch with them on the return drive.